Growing up my family did not eat rice. I thought rice was "fancy." I changed my eating habits and made Minute Rice a part of my daily eating. It was quick and easy to make after work, and always tasted perfect! In my home, brown rice is popular and a staple in our pantry and most of our meals. Like most families, we have crazy busy schedules. available for my family at meal times. 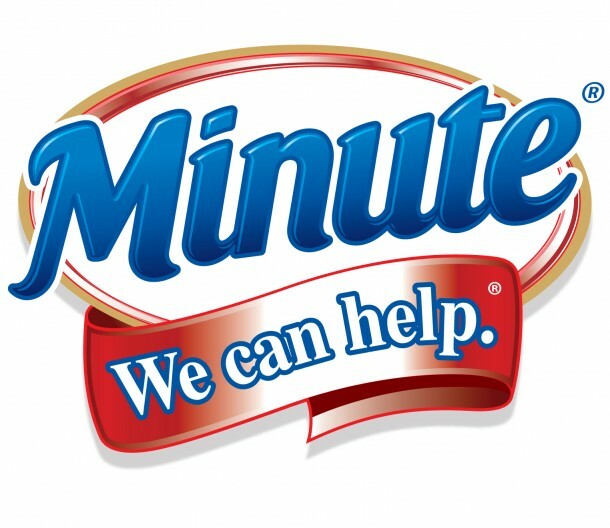 Minute Rice is one of those products. Since 1949 Minute Rice has provided healthy meal solutions for families like mine! for years and it is one of my favorite dishes. You can serve it alone! You can serve it as a side dish! You can serve it in a tortilla! After you try this salad, you may even want to add other ingredients like black olives or chopped tomatoes. Or substitute dill for cilantro. Or switch up the dressing. 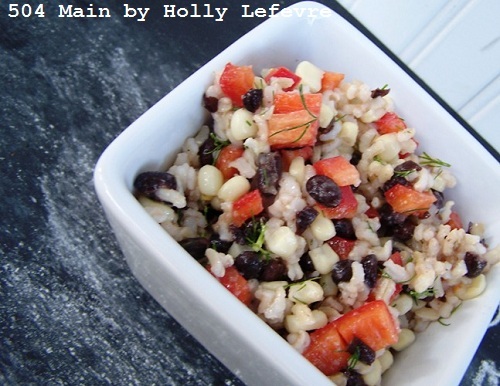 Minute Rice Brown Rice makes a great base for this very versatile recipe! Black Beans, Corn, Red Pepper, and Brown Rice "Salad"
1 Serving of Minute Rice Brown Rice (2 cups water to 1 cup rice, prepare as directed). I used brown rice, but you can use white rice Minute Rice too! 5 stalks of fresh dill (you can adjust the flavor to your tastes). Dill leaves removed from the stalk, and chopped. Wash and strip the leaves from the dill, then chop coarsely. Place rice in a large bowl, add the peppers, beans, and corn. Toss to mix. Use 4 Tablespoons of the dressing (or more if you desire) and toss the salad. Oh you like those tortilla cups? 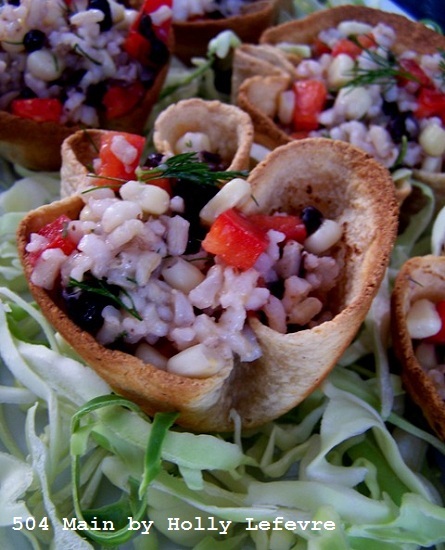 They are so great for a quick bite at a party! And just fun! Heat the tortillas for 30 second in the microwave or until they are pliable on the stove top - this keeps them from cracking when you place them in the muffin tin. What's so great about this salad? You can eat it as is...and it is delicious. It stays fresh for days in the frig. Minute® Rice is so quick and easy to prepare and is great pantry staple. When meal time seems like a hassle, Minute® Rice is a go-to ingredient your whole family will love and allows you to have more quality time doing what your want with your loved ones. Leftover rotisserie chicken or veggies from a meal earlier in the week? Minute® Rice can easily be paired with some of your leftover ingredients to make a quick, easy and wholesome meal your whole family will love in just a matter of minutes. Visit http://www.minuterice.com/ to create a great main meal or side dish for your next family get-together or potluck. 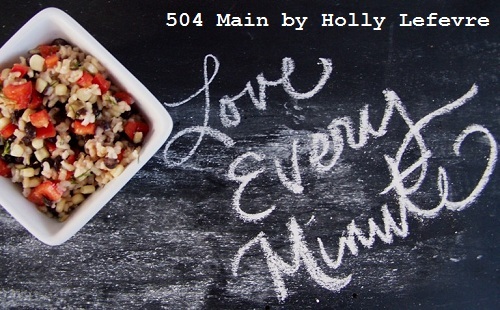 This post is written and created at 504 Main by Holly Lefevre This is a sponsored post written by me on behalf of Minute® Rice. 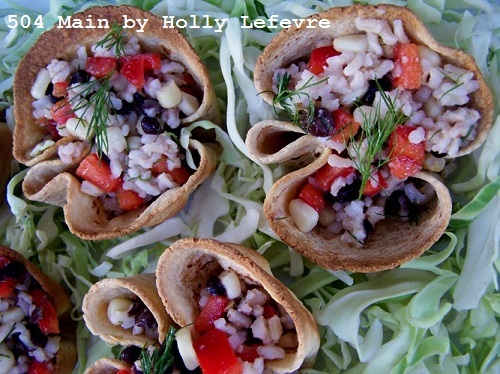 Holly, I love how you often have something wonderful to eat posted on your blog. I also like how you offer things that are not only good, but easy to make. Thanks for doing it again!